Books for you! Books for all! Hello old chums! I’m not even going to mention, more than this brief moment, my lack of blogging frequency. I have books to recommend and a few other things to mention. This post may be a bit hodgepodge but who doesn’t love that? I was in a bit of a book slump earlier this month and at the end of March. Transitioning to a new job made me a bit stressed and so felt I couldn’t devote quite enough time to reading. I did read, but it was a little lackluster. Now, I feel I’m on a string of books that I’m really enjoying and have the potential to stick with me for a while. Final book! Eeee!!! Did I mention I saw Laini Taylor and she’s lovely and her pink hair is amazing?! First up the last book in the Daughter of Smoke and Bone series by Laini Taylor. I wrote about this book when I first started the blog, and going back I see that somehow, I wasn’t as enamored of it as I thought I was. I really, really love this books now, so why wasn’t I more excited about them? I am unsure but I do know that since then, they have hovered at the edge of my mind when I am recommending books to teens or to friends. I recommend these books all the time! Why haven’t you read them yet? They are so lovely with great characters, beautiful writing, sweet settings with Prague and Moroccan kasbahs, and a story that will stay with you. It is a mix between a fantasy and a paranormal romance and the world really catches you up in it. Daughter of Smoke and Bone sets up the love story between Karou, a blue haired errand runner for a mysterious ram-headed creature named Brimstone, and Akiva, an angel from a parallel world who is the mortal enemy of Brimstone’s race. 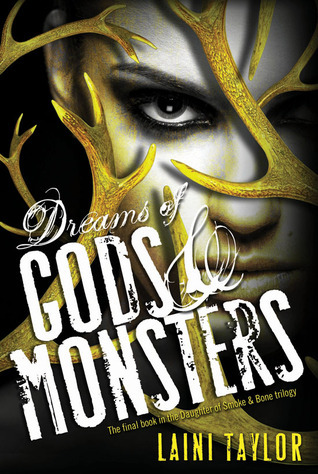 Romance is kindled; secrets and twists are revealed.Days of Blood and Starlight serves to keep Karou and Akiva apart in heartbreaking fashion, and Dreams of Gods and Monsters bring them and all their friends back together to stop the apocalypse and eat cake. Seriously. On a completely planet in the book universe is Scowler by Daniel Kraus. The two books of Kraus’ that I have read are studies in realistic horror. Rotters dealt with the macabre and disgusting world of grave robbing and drugs – where we learn always to name your shovel – and Scowler is a thesis on domestic and child abuse on a dying Iowa farm. For the horrible subject, it’s written very beautifully. Kraus draws you into the terror of the Burke family with ease. The man can write horror, and disgusting, unsettling horror at that. Both Scowler and Rotters have grossly violent eye parts, so if you’re paranoid about something happening to your eye, and if the phrase vitreous “fluid”in the context of eyes grosses you out, this book may not be for you. Some of the scenes from the book will be with me always. Case in point and mild spoiler alert: Marvin Burke, the abusive patriarch, sews his wife to their mattress because he’s mad about her taking on mending jobs for extra money. Sews her through the skin of her ear, elbow, hip, leg, labia, and ankle to the bed. It’s a day before Ry, their son, finds her. That’s something you don’t forget easily. Definitely a good book, but not an easy one to read. I listened to it on audio and needed a lot of breaks. What have you read lately that you’ve loved?